Headed up by Johannes Kuehn and professor Sami Haddadin from the Leibniz University of Hannover, the idea has been to teach AIs to recognise when they've become damaged by creating a series of sensors. Much like nerves in the human body, the team created a, "nervous robot-tissue model that is inspired by the human skin structure," and grafted it to a robotic arm. When the tissue becomes damaged by heat or impact, the tissue will send 'pain signals' that will prompt the robot to move or protect itself from further damage. With more and more automated robots being used in close proximity to humans, the hope is such a technology could extend the lifespan of each one by helping it to identify and avoid danger. "A robot needs to be able to detect and classify unforeseen physical states and disturbances, rate the potential damage they may cause to it, and initiate appropriate countermeasures, i.e., reflexes," said Haddadin and Kuehn in their official paper on the project. "In order to tackle this demanding requirement, the human antetype shall serve as our inspiration, meaning that human pain-reflex movements are used for designing according robot pain sensation models and reaction controls." 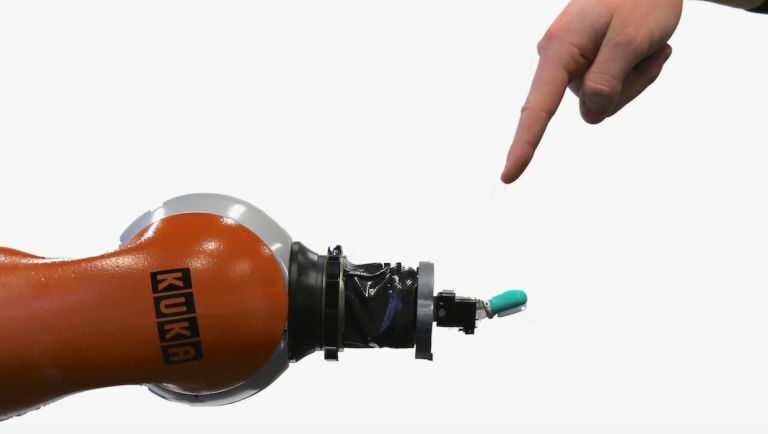 Haddadin and Kuehn presented their paper at the IEEE International Conference on Robotics and Automation (ICRA) in Sweden last week, and as you can see from the video below it's certainly an intriguing innovation for modern robotics.